MEMPHIS, Tenn. ““ If there is anything that can bring the Jews of Tennessee together, it would be barbecue. Earlier this month, the 23rd annual Kosher BBQ Contest and Festival drew thousands of Jews from Tennessee and around the country. It attracted a group of Muslims, too. Turns out they’re not bad at cooking kosher brisket: The Memphis Islamic Center’s team, the “Halal Smokers,” won a third-place award for their brisket entry. The commingling of Jews and Muslims among tables heaped with baked beans, hamburgers, and ribs provided a counterpoint to anti-Muslim protests in Murfreesboro, and death threats aimed recently at mosques elsewhere in this state. “This is what America is all about,” Adam Itayem, who manned the Halal Smokers’ booth, said during the event. Itayem is also the owner of Tom’s Bar-B-Q in Memphis. “People from all over the community feel comfortable coming year after year,” observed Rabbi Joel Finkelstein, the rabbi of Anshei Sphard-Beth El Emeth, the Orthodox synagogue that organizes the annual event and holds it in its parking lot. “It is the only event I know that brings the entire Jewish community together,” said Steve Kaplan, a longtime organizer of the event. He estimated that 3,000 people in all came to the festival. Warren Binderman, an accountant whose “Grillin Tefillin” teams had baked beans bubbling on the grill in Memphis, said he’s trying to start a similar contest in Atlanta. Marvin Rembo, of Jericho, N.Y., a chemical wholesaler, was sent by his synagogue to scout out the Memphis competition. His mission, Rembo said, is to launch a Long Island-wide kosher barbecue competition next June that will be sanctioned by Anshei Sphard-Beth El Emeth. The winner will get to compete in Memphis – which can make the uncontested claim, at least for now, of hosting what has quickly evolved into North America’s world series of kosher grilling. “Eisenhower invaded Europe with less preparation than these guys did to get ready,” Rembo said of the organizers of the Memphis barbecue. For the crowds this weekend, Sunday was an opportunity not just to tantalize the taste buds but also to pet goats, shoot some hoops, and meet up with friends from around town. Some 45 teams participated in the cooking contest, with each paying a $125 entrance fee in addition to buying all the kosher meat and ingredients they needed. With smoke from the grills hovering over the parking lot, the scene had the air of a Civil War reenactment. Stuart Lazarov, an anesthesiologist and past president of Anshei Sphard-Beth El Emeth, said sponsors of the event this year included a medical center, a property-management firm, a bank, a casino, law firms, and a frozen yogurt store. In a humorous nod, a group of gastrointestinal specialists sponsored a pickle-eating contest. 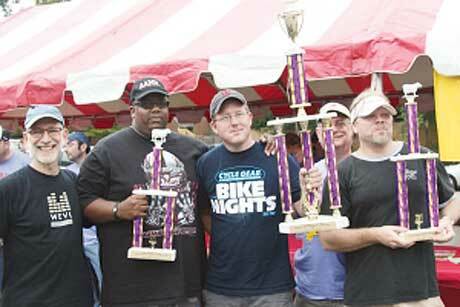 The grand prize winners, and victors of the ribs competition, were the “Pickering Potchkers.” The best brisket went to “Grills Gone Wild.” The baked beans of the “Cow Towers” took first place in the beans category. Aside from meat, the main draw of the day was a basketball tournament in which 40 teams competed for trophies in three-on-three competition. The power forward for the University of Memphis men’s basketball team, Tariq Black, chatted with fans of his team.